Anchored in music, movement and community the FitDC fitness series, boasts a free, hour-long workout tailored for all levels. Each workout is hosted outside in the heart of Downtown Chandler. Find your fit and stay motivated to reach your goals by sweating it out at local workouts led by talented fitness professionals. Weekly fitness formats coming soon! Zumba: a mix of low-intensity and high-intensity moves for an interval-style, calorie-burning dance fitness party that feels like exercise in disguise. Zumba incorporates Latin and world rhythms creating a total-body workout combining all elements of fitness – cardio, muscle conditioning, balance and flexibility, boosted energy and a serious dose of awesome each time you leave class. P90X: a total-body workout that will keep your body guessing – and transforming – with a variety of strength-training moves, cardio conditioning, and core work. INSANITY: cardio conditioning for every fitness level. Together, you’ll build strength, improve cardiovascular endurance, and develop precision and speed – without a single weight. JACS Muscle Madness: Firing up the metabolism with some lower body strength moves: a little physical power goes a long way! We're going to have a muscle-up fit party with our bodies! JACS Tabata Time: You can do anything for 20 seconds! This 20 second work, 10 second rest workout is going to get the heart pumping, blood circulating, and you feeling good all over! It's a natural happy hormone booster! Turbo Kick: classes are packed with real kickboxing moves, calorie-blasting HIIT training and bodyweight exercises. You’ll leave every class dripping sweat – and ready to conquer anything! Total-body cardio will sculpt your upper and lower body and burn major calories with rhythmic boxing and kickboxing combinations. PiYo: combine the muscle-sculpting, core strengthening benefits of Pilates with the strength and flexibility of flowing yoga movements. You’ll perform a series of high-intensity, low-impact moves that will work every single muscle for a long, lean, and incredibly defines physique. Fire Up: by incorporating movement to the hottest beats and (off the beat Tabata style) and the mind/body connection all in one class. Fire Up will take you on a journey from start to finish. This program is targeted to help you transform physically, mentally and spiritually. The program is designed to be more than just another fitness class. High Fitness: this class results in high energy, intense and crazy fun workout that leaves participants feeling HIGH and wanting more. Out formula alternates between cardio peaks and toning tracks that will take your heart rate to the sky and strength to the next level. Lauren Zaslow Saks is an AFAA certified group fitness instructor, owner of Energized By Exercise With Lauren, and creator of the FitPHX fitness series, Fall Into Fitness at Hance Park. She is a firm believer that exercise can be FUN! Prior to her work in the fitness industry, Lauren worked in healthcare providing services to individuals with developmental disabilities, hospitalized patients, and individuals receiving hospice care. Born and raised in Hong Kong, Danielle is city girl at heart with a love for the great outdoors. She prefers to spend her free time either shopping or staying active. She loves bootcamp, obstacle courses, and snowboarding. She also loves to run, hike, and bike. In 2016, she completed her first Half Ironman 70.3 in Houston (barely surviving). That same year, she got certified in TurboKick, her soul-mate workout, which she now happily teaches at Mountainside Fitness. She also enjoys teaching various group fitness formats such as PiYo, P90X, Muscle, Tabata, etc. Danielle is now happily married to her husband, Terence. They have two fur babies, Tobey and Maggie, 1 and 5 year old corgis. When not exercising, Danielle can be found either at the hospital caring for sick kids as a doctor or at home pampering her canine children. Ashley Marks is a certified Turbo Kick Live instructor. Ashley got her start into group fitness when she walked into her first group fitness class while attending the University of Arizona. From then on Ashley was hooked. Fitness then became such a part of her life, helping her with the stress of studying for her engineering classes, to even now! Ashley is so happy to be a part of FitDC this year, and hope to see you all soon! Jacquese Silvas, M.A.Ed., B.S.BM. has been in the fitness industry for 25 years. She is the owner of JACS Figure On Fit, a private club, and works as a wellness coach to enrich both the mind & the body. Jacquese is AFAA certified, a personal trainer, a group instructor certified in ten formats, a master trainer for MASHUP®, Tabata Bootcamp,™ and Fluid Strength™. 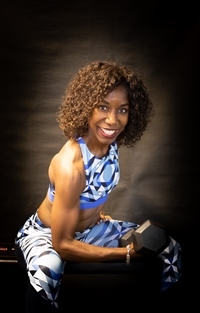 With a Masters of Arts degree in Education, Jacquese combines her love of teaching & fitness by additionally teaching health classes. She is a published author, and does motivational speeches for schools, colleges, and corporate organizations. She has a comprehensive knowledge of the human body & exercise physiology, nutrition, behavioral science education, and significant information on the scientific study of human movement. Jacquese desires to share the hope, the challenge, and the behaviors necessary that allow you to dream, create new dreams, and actually live them. Her mantra is to live the life that you want to lead, and she does this through fitness, nutrition, and strong mental health promotion. Autumn Torres ...her motto is - just show up, take one day at a time and give your best effort – is what she tells everyone as they start on their fitness journey. She uses a mixture of HIIT and Strength Training to help people of all fitness levels achieve a balanced, healthy lifestyle they can sustain over the long term. Growing up, Autumn was a competitive dancer and always enjoyed being active. Autumn have been able to teach kids dance classes and also kids cheerleading over the years. Her passion has turned into helping individuals of all ages through group fitness classes and also private training. Autumn enjoys spending time with my husband, 3 daughters and 2 granddaughters any time I can.